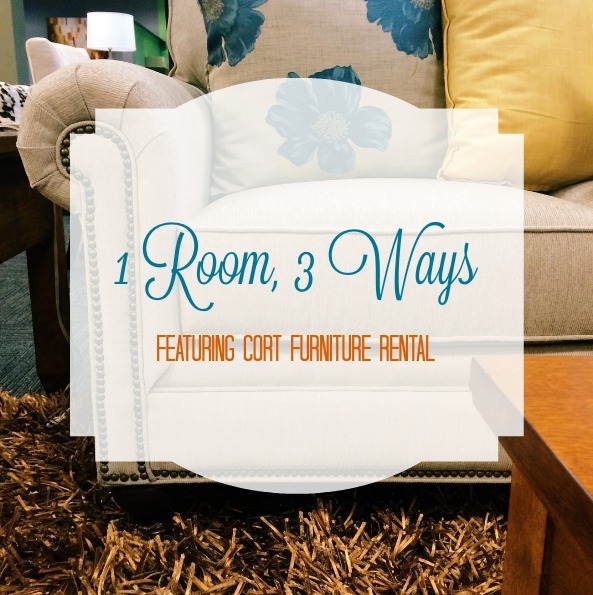 CORT Furniture Rental is a national industry leader in the furniture rental space—and they help make furnishing and decorating your space as convenient as possible. Know what you like? 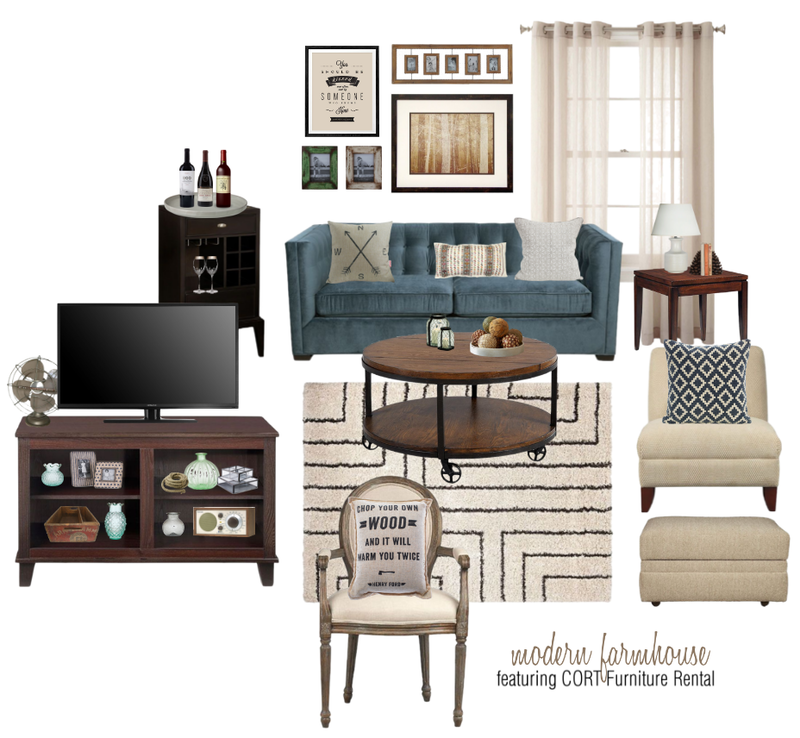 You can rent furniture by the piece to express your individual decorating style. Trust the experts for guidance? They offer move-in ready packages, too. Either way, the furniture is ready when you need it, yours for as long as you need it, and gone when you don't. No hassle. More flexibility. And the best part? Tons of style. Yes, this is all from CORT Furniture Rental! I set out to create a living room look—well, actually three looks—using furniture from CORT. Why the living room? Because whether you lease an apartment or own a house, the living room is literally where the living happens. It's where you curl up on the couch for a movie. It's where you play board games. It's where you sip wine and girl-talk. So I think it should be the first space in your place to get decorated. 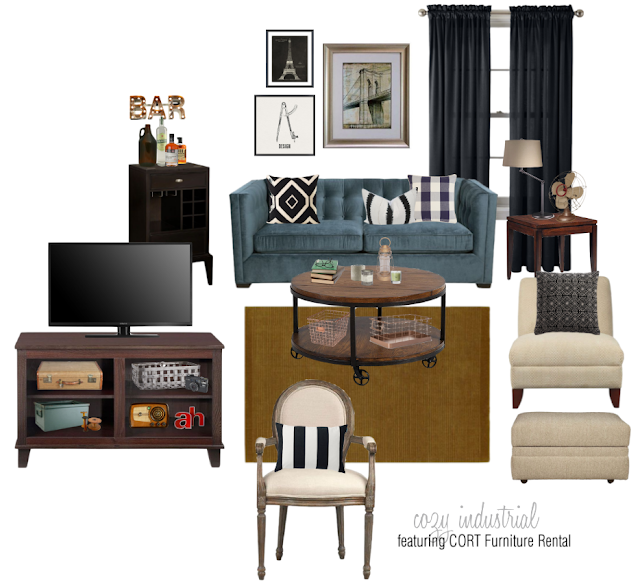 I went "window-shopping" on CORT's website and fell in love with so many pieces. 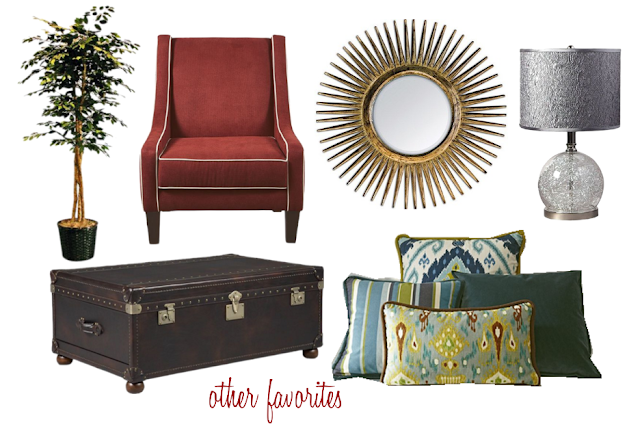 If you're expecting neutral, plain-jane furnishings... think again. Don't get me wrong—there are plenty of beautiful beige and white options if that's your thing. But you know me—I'm an orange couch kinda girl. 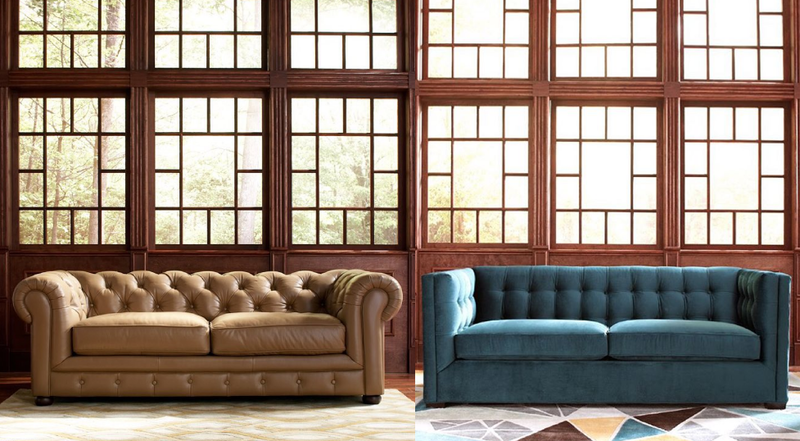 And from the handsome, leather chesterfield sofa to the sleek, velvety tufted couch... choosing just one set of furniture for my imaginary living room was difficult. After much deliberation, I went with the tufted sofa in the rainy-day-sky-blue color (picture above, right). Isn't it dreamy?! What was my strategy? Well, I didn't have one. In fact, I wanted to challenge myself. So I picked pieces that I loved but that you might not expect to see together. It started with that great couch. Then, I chose two chairs: a comfy armless chair and a more elegant accent chair. 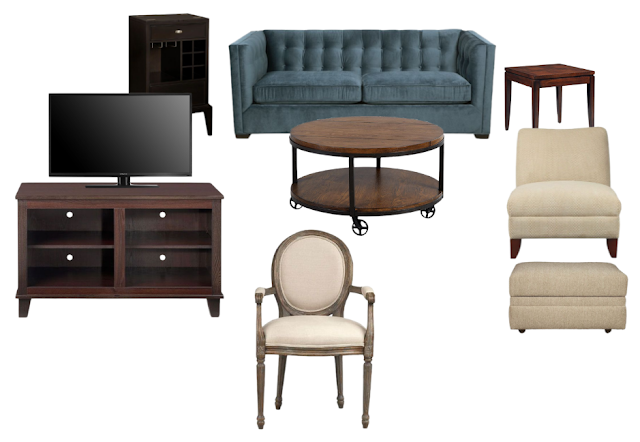 I opted for a tv stand that offered plenty of storage, and a side table with a rich wood tone but versatile silhouette. I am a firm believer in furniture with wheels—so I sprung for this round cocktail table for a coffee table. And I couldn't resist the wine cabinet. Because wine. Now for the hard—errr, fun!—part of creating three entirely differently looks with those pieces. 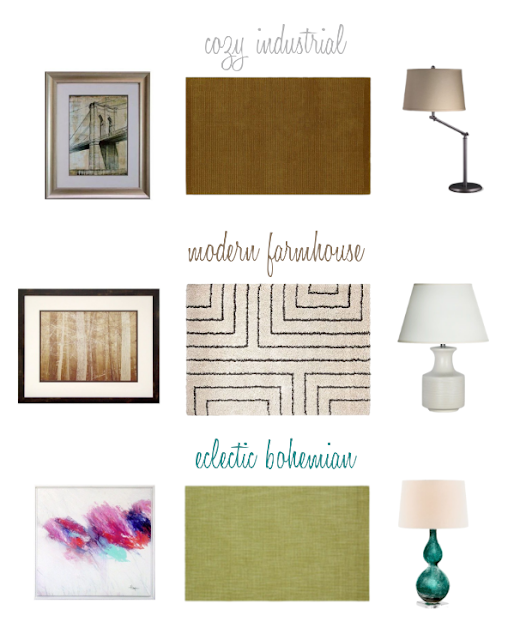 Luckily, CORT also offers art, rugs, and lamps. Let's start with cozy industrial. Because who knew "industrial" could be so warm and inviting, right? I accessorized the television stand with vintage memorabilia. Wire baskets tuck underneath the coffee table for handy storage. There are a mix of metals throughout the room—burnished gold, old copper, and galvanized steal. The artwork features architectural illustrations and a graphic print. I kept the color scheme pretty neutral and added pattern with a mismatched variety of black and white pillows. It turned out handsome, cozy, and sophisticated. Last but certainly not least, the eclectic bohemian room is the living room I'd create if I were actually moving in. I feel most at home in an eccentric boho room because anything goes! You can mix and match patterns, colors, and styles to your heart's desire. So that's what I did. I pulled some colors from the abstract painting—like that lovely orchid pink for the curtains, splashes of cyan, and pops of red. I threw around throw pillows in a variety of patterns and colors—from busy floral to graphic, monochromatic prints. I had a whole lot of fun accessorizing with vintage items, bits of gleaming gold, and book. This room is so happy, vibrant, and feminine—yet grounded and chic thanks to the balance of color and rich, dark wood tones. There were a few other items from CORT's website that I adored, but didn't incorporate this round. For instance, that beautiful red chair—now that I think about, it could have worked for a pop of color in any of those three rooms, too! I have a thing for sunbursts mirrors. (Someday... someday I will have one.) I also loved this gray, glass-based lamp and steamer trunk coffee table—yay, storage! And you may be surprised to learn that CORT also offers plants and throw pillow sets. The pillow sets are even pre-mixed-and-matched for you. 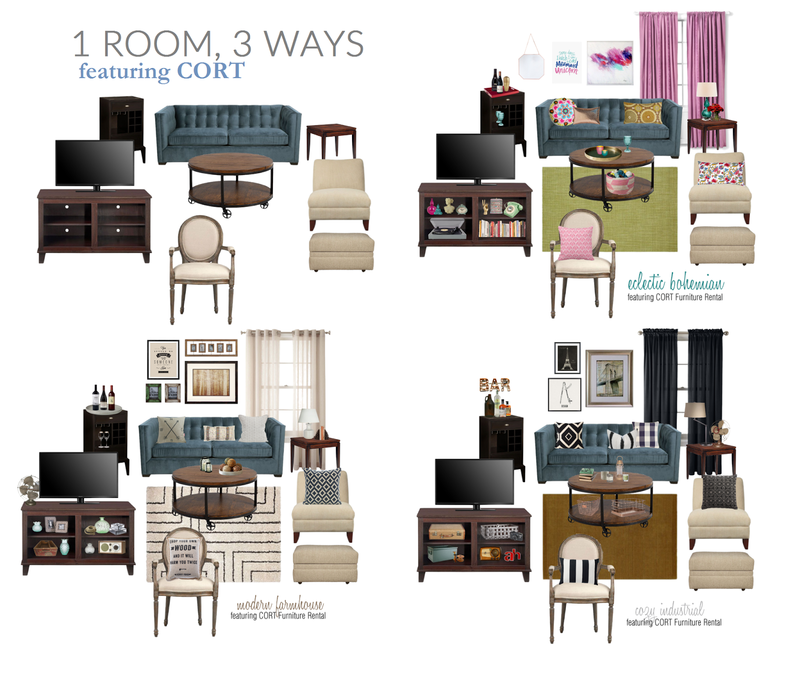 There you have it—one room furnished by CORT, styled three different ways. 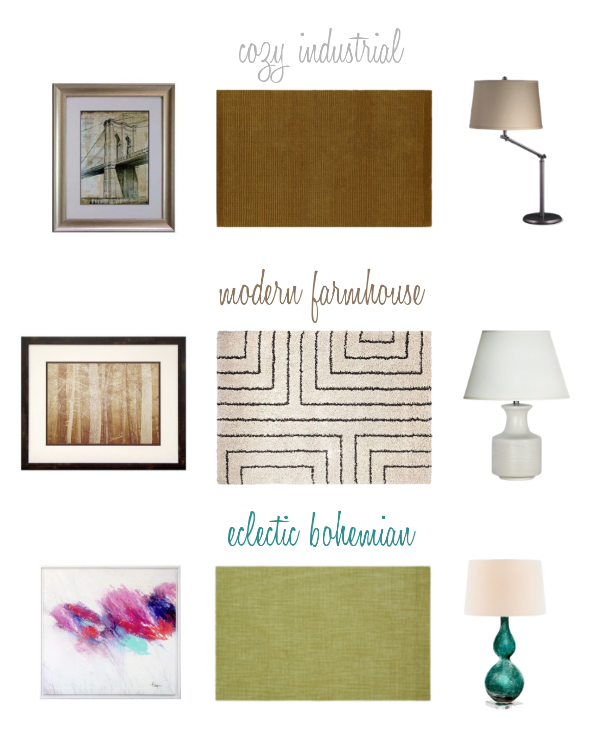 I've already confessed that the eclectic bohemian look is my favorite. Which one is yours? The decoration in the first picture is beautiful, but I like the wooden chair, it gives the feeling of the room is larger. Definitely liking #2 the best! That rug is way too cool. It really ties the whole room together. The rugs in the other two just don't match that well I think. Most def liking #2, it is beautiful eye catching. #2 is nice any comment as where to get one? please let me know :) Thanks for sharing with us.